Picture and photo from Blogchef.net. Step 1: Fry ground pork in a little oil until the pork is completely browned. Drain and set aside. Step 2: In a large bowl combine cabbage and carrot mixture, cooked ground pork. Season with 1 tablespoon of oil, sugar, vinegar, salt, pepper, and garlic powder. 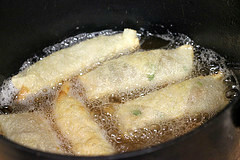 Step 3: Lay out an egg roll wrapper. 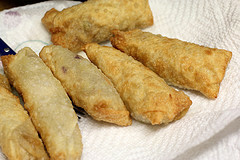 Place 1-2 tablespoons of filling in the corner of the wrapper, but not so the filling is actually touching the corner. Fold over that corner and roll about half of the way up. Fold over the left and right corners to the middle. Using a brush or the bottom of a spoon, brush the beaten egg on the edges of the wrapper. Finish rolling up tightly and secure to make sure there are no leaks. 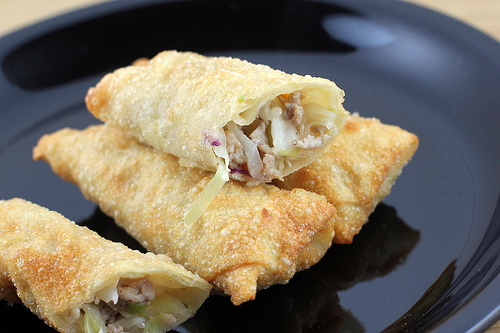 Repeat until all the egg roll wraps are used.